George Zimmerman who shot dead unarmed 17-year-old Trayvon Martin on February 26, was arrested by Seminole County law men in Florida, Wednesday, April 11, after state attorney Angela Corey completed investigations and had the killer charged with second degree murder. 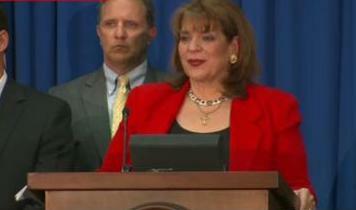 Florida state attorney, Angela Corey, announcing the indictment of George Zimmerman. The controversial killing which first saw police freeing Zimmerman on the grounds of self defence, triggering weeks of public protests, has stirred questions about the justice system in the state and sparked accusations that race played a part in the police decision and the shooters actions. Martin was walking in the rain towards his father’s home in the central Florida community of Sanford. Zimmerman was driving by and felt Martin looked suspicious. He had his Glok pistol on him. He stopped his truck, started following the teen. He called 911 to report the boy as a suspicious character. Scared,the boy ran when he realized he was being followed. Zimmerman tells the police the boy is running. They tell him, don’t chase the person. But Zimmerman chased him in the dark and caught up. People hear screams and shouts for help. Bang! The boy is dead with the iced tea and candy he was eating. Zimmerman told police he killed Martin self defence as the boy attacked and battered him. Zimmerman was released and launched appeals to the community and country to support his healing for the deep wound at the life changing encounter in which he was a victim. Even an honorary LLB or JD can figure this one out. Just go by Zimmerman’s evidence and the 911 calls. Don’t listen to the race and other side issues. But without public pressure, this case would have gone by the wayside.